Azerbaijani national karate team returned from Venice (Italy) with three medals in the last league tournament. 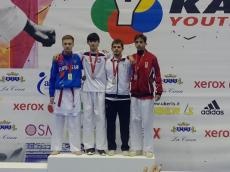 Young Huseyn Mammadli (-57 kg, personal trainer Abulfat Garayev) and Tale Yagubov (-63 kg, personal trainer Jahangir Babayev) won gold medal among 14-15 years old karatekas and Aminaga Guliyev (-61 kg, personal trainer Elnur Hasanov) won a silver medal among 16-17 years old karatekas. Polina Qurenko, one of the leaders of the youth team of 16-17 years old (-53 kg), was unable to fight because of injuries in competitions. As many as 2,652 karatekas from 67 countries were competing in the final competition of the Youth League, which the World Karate Federation started to organize this year. This tournament for national youth team led by coach Anar Allahverdiyev also featured preparation for the European championship in Denmark in February 2019. The WKF Youth League was the last official international tournament in 2018 with Azerbaijani karatekas. After the first sessions of the competition, representatives of Russia, Slovakia and Azerbaijan were dominating in the tournament with three gold medals respectively. The massive event concluded on December 16 with the rest of the categories at stake. The Karate 1 – Youth League is a newly created competition conceived to highlight the impact of Karate in young ages. Established under the umbrella of Karate 1, and designed to complete Karate 1-Premier League and Karate 1-Series A, the Karate 1-Youth League aims at becoming a platform for the development of youngsters in their quest to progress in the sport. The National Karate Federation was founded in 1994. In 1997, the National Federation became a full member of the World Karate Federation (WKF), the largest and most powerful karate organization in the world, comprised of 183 countries and more than 50 million members. A year earlier, the National Federation joined the European Karate Federation (EKF). The National Karate Team is one of the strongest teams in Europe and the world. Over the past few years, Azerbaijan`s karate fighters have been the winners of the prestigious international tournaments, European and World Championships. Currently such stars as repeated World and European Champion, winner of the World Games Rafael Agayev, World Champion Israfil Shirinov, Ayhan Mamayev, Europe Champions Parviz Abdulkarimov, Jeyhun Aghasiyev, Rustam Madadov, Fayyaz Ildirimzade, Niyazi Aliyev and Asiman Gurbanl?, bronze medalist of European Championship Amal Atayev, Yusif Jafarov, Shahin Atamov, Rashad Huseynov and Ilaha Gas?mova are in the national team.